Raf Grassetti is the art director for last year’s God of War, but he’s much more than the artist behind the game’s scarred and battle-worn characters. His Instagram and Twitter show that the artist’s a huge fan of numerous other franchises, too. And his latest love is for Super Smash Bros., an obsession that has led him to kick off a series of Instagram posts sharing his favorite Smash fighters, reimagined. We’ll be upfront: Grassetti is wildly talented, as the majority of his work shows. And several of his Super Smash Bros. portraits are also wonderful. Metroid’s Samus Aran looks great, for starters; it’s a svelte, statuesque impression of the powerful bounty hunter. We’re especially into this buffed-up Fox McCloud, his third piece in the series. But his latest material is delving into uncharted territory, and perhaps it was that way for a reason. On Sunday, Grassetti introduced the world to his vision of Bowser — “King of the Koopas,” as he calls him. And what a sight it is, one we cannot ever unsee. 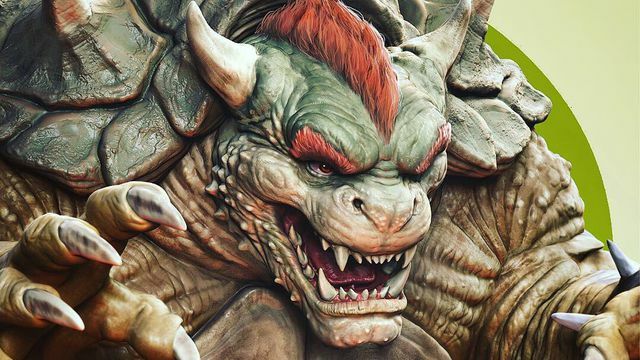 The Mushroom Kingdom may be constantly under siege, sure, but I imagine it would be completely ravaged by now if Bowser stomped in looking like … well, that. Given that the upcoming Sonic the Hedgehog movie will give the blue blur a beefy set of calves (a reality we are still coming to terms with, mournfully), perhaps Grassetti is simply ahead of the curve. As much as we’re enjoying his Super Smash Bros. Remastered series, we’re quietly grateful that Super Smash Bros. Ultimate follows in the tradition of its forebears with a pleasantly cartoony design. Grassetti promises more artwork to come, teasing a Mewtwo portrait next. At least we know Mewtwo is already bizarrely muscular for a Pokémon, so we may be better prepared for the God of War artist’s next post.